I would like to extend a heartfelt thank-you from the officers and board members of the Federal Point Historic Preservation Society to Mr. Vernon Meshaw who salvaged the plaque mounted on the historic Swing Bridge over Snow’s Cut! It is a great addition to our collection and will be displayed for all to see at the History Center. At our November meeting Mr. Vernon Meshaw, a scrap metal dealer, presented the bronze plaque he salvaged from the Snow’s Cut Swing Bridge to the Society. Until Mr. Meshaw contacted the Society no one knew where the bridge had gone when it was decommissioned upon the opening of the current high-rise bridge in 1962. 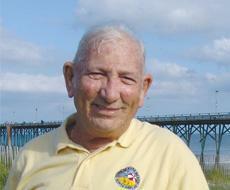 It turns out that Mr. Mannon Gore, the developer of Sunset Beach, had purchased it from the NC Highway Department. However, after ten years of trying to get approval for use from the mainland to the new development at Sunset Beach, he realized the state would never let him install it, and contacted Mr. Meshaw about selling it as scrap. 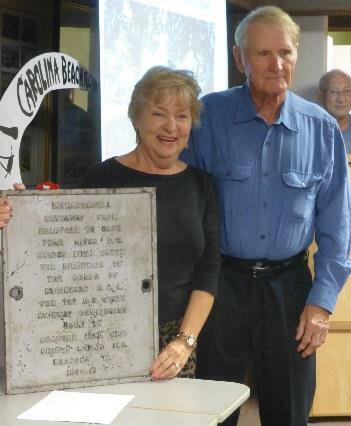 Luckily, Mr Meshaw had the presence of forethought to keep the memorial plaque that recognized the North Carolina section of the Atlantic IntraCoastal Waterway. 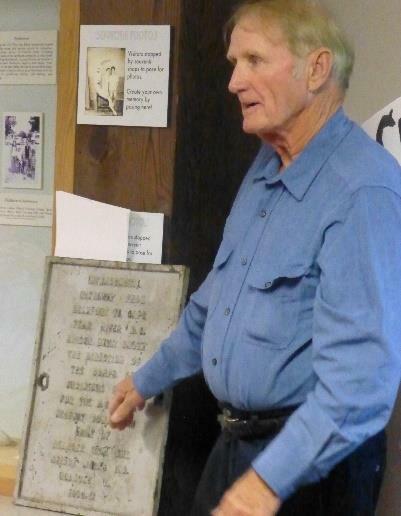 The Federal Point Historic Preservation Society is deeply grateful that he offered to donate it to the Society for display at the History Center. Also on the program was Frankie Jones, whose father was the last bridge tender of the swing bridge. She talked about her childhood and how it revolved around the blast of the horn, that signaled the bridge’s opening. Also present was Billy Holt, whose father was the relief tender (they worked 12 hour shifts), who told us about how they turned the bridge if the power went out. Oh, and how they tied it down when hurricanes threatened. To round out the evening Elaine Henson presented the history of the ICW, Snow’s Cut and the Swing Bridge. She showed many great pictures, including the iconic Hugh Morton photo of a speed boat passing through the open bridge. As most of you are aware, my father was one of the bridge tenders of the Snow’s Cut Swing Bridge. My parents moved here from Brunswick County in the early forties to take the job. At the end of what is now Bridge Barrier Road, where the bridge was located, the state had two three-room houses which were rented to the bridge tenders. Our family lived in one house and Mr. Holt, the other bridge tender and his family, lived in the other. Our house was the closest to the waterway and the Holt house was about 40 feet south of ours. The bank has now eroded so much that our house would be gone had my father not purchased the house and moved it to Spencer Farlow Dr. When the old one-room school-house on lower Federal Point, in New Hanover County, NC, burned down mysteriously in 1916, it became necessary to transport the few children who attended there to Myrtle Grove school six miles up the peninsula from Carolina Beach. Miserable transportation conditions at the time and obvious overcrowding persisted. Over time, adverse conditions at Myrtle Grove school reached the point of barely tolerable. The beaches of lower New Hanover County began developing into a vacation resort creating an influx of many more year-round families. The need for another school became critical to meet the growth. During 1937, public-spirited citizens in the County began meeting and organizing to appeal to New Hanover County Board of Education for a new school to be built at Carolina Beach. Under the leadership of Mayor R.C. Fergus, Mrs. H.B. Strickland, and others, permission and support were granted and work began in the fall of 1937 under the direction of contractor, W.A. Simon. Cost of the building was $20,000.00. It was built on a complete city block between 4th and 5th Avenue, with Atlanta and Clarendon Avenue on either side. The block owned by the Town of Carolina Beach was eventually transferred to New Hanover County Board of Education. During construction, area students (approximately 50) were schooled in two small rooms in Carolina Beach Town Hall located on the Boardwalk. Grades 1 – 3 were taught by Miss Mae McFarland and Grades 4 – 6 by Miss Madge Woods. 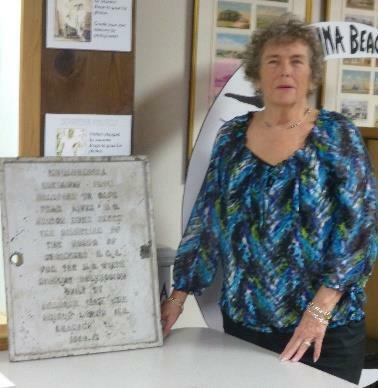 Under the leadership of principal, Mrs. C. G. Vanlandingham, Carolina Beach School opened for the school year 1939-40. Few knew that the growth that created the need for the school was only just beginning. Within two years, it became necessary to add three new classrooms and other amenities costing $28,000.00. Keen foresight during the original school design allowed for additional growth. In 1953, three more classrooms, a kitchen and other amenities were added. By 1975, it became necessary to add a six classroom wing with additional trailers and teachers to meet new growth. In 1983, the school was reconstructed due to significant damage by fire in 1982. It’s anyone’s guess as to what the future holds for Carolina Beach School as growth continues. One thing remains certain, the community takes pride in Carolina Beach School and its excellent staff. In these early grades, students receive a very important educational foundation, preparing them for the higher grades. Carolina Beach School turns 75! 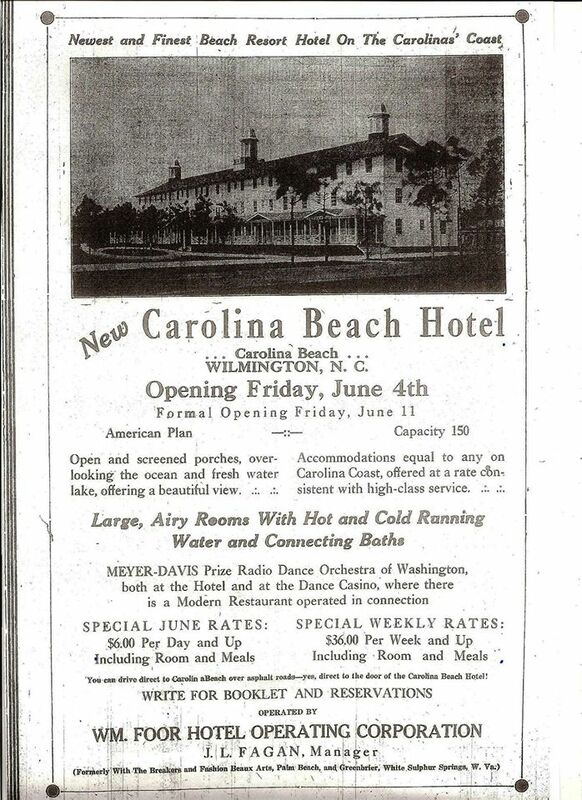 Carolina Beach School was built on the site of the ill fated Carolina Beach Hotel which opened in 1926 by the Carolina Beach Lake. The 100 room hotel was designed by Leslie Boney and built by W A Simon who also later built the school. First Baptist Church of Carolina Beach Turns 75! 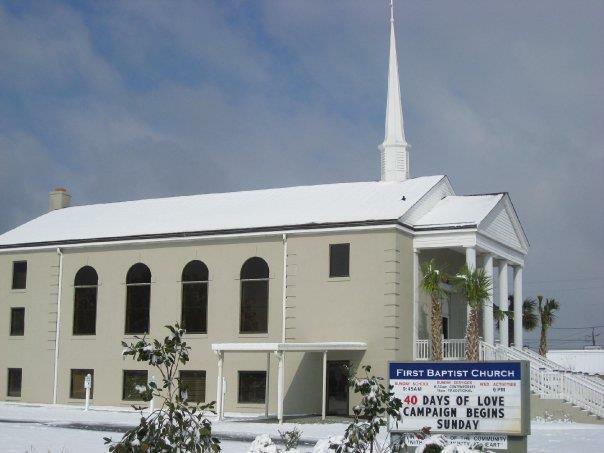 Present day Carolina Beach Baptist Church got its beginning on November 20, 1938. Baptist members of an interdenominational Sunday School building, which was built a few years before on Fourth and Cape Fear Blvd., decided it was time to build their own church. Other denominations began to splinter off as the area was growing and the population increasing. At the end of the service, twenty persons stood and became charter members of the Carolina Beach Baptist Church. Committees were formed to make the new church happen. Progress was slow until 1942 when the influx of military personnel and defense workers made the erection of a building for worship imperative. Chris Fonvielle Signs New Book! 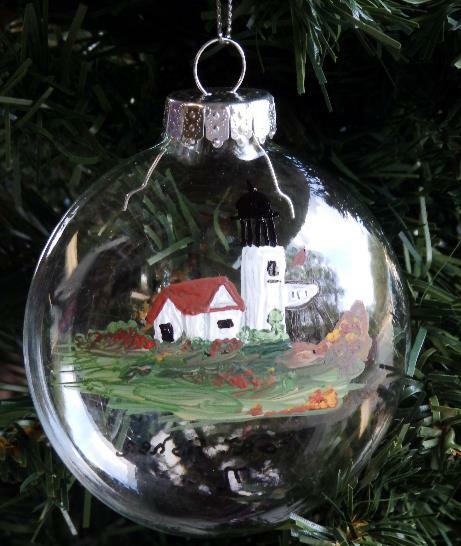 Fort Fisher State Historic Site in Kure Beach, NC, will hold its Holiday Open House on Tuesday, December 10, 2013, from 10 a.m. – 4 p.m. in the visitor’s center. This event is free and open to the public. 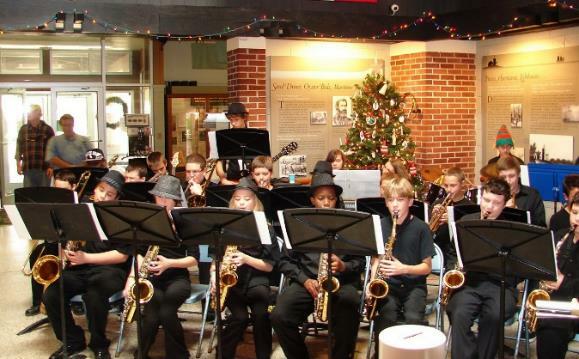 Enjoy seasonal refreshments, decorations, and entertainment throughout the day, including holiday musical selections by the Murray Middle School Jazz Band under the direction of David Tyson, followed by popular musician and storyteller John Golden. For the history lovers on your shopping list, special discounts will be offered on all museum shop merchandise for this one day only, so you can stock up on everything from Battery Buchanan Blend coffee to unique Christmas tree ornaments to great books for the history enthusiast. Speaking of books, Civil War historian, author, and professor Dr. Chris E. Fonvielle, Jr. will debut his new book Faces of Fort Fisher: 1861-1864. At 12:30 p.m., Chris will speak about some of the memorable people associated with wartime Fort Fisher in the visitor’s center’s Gehrig Spencer Theater. Following the presentation, Faces of Fort Fisher may be purchased from the Museum Shop and will be signed by the author. Before the program concludes, the Friends of Fort Fisher will announce the winner of the 2013 rifle raffle, at which a lucky ticket holder will win a reproduction Civil War Springfield Musket. Raffle tickets are available right up until announcement time. 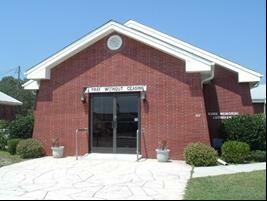 Fort Fisher State Historic Site is located at 1610 Fort Fisher Blvd S, Kure Beach, N.C. 28449. This free event is sponsored by the Fort Fisher Chapter 2325 of the United Daughters of the Confederacy and the Friends of Fort Fisher and its sustaining members. 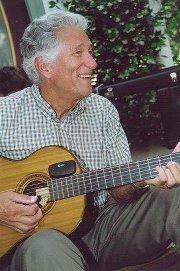 For more information, contact Paul Laird at 910-612-7067 or plaird@friendsoffortfisher.com. Don’t forget our gift Shop! 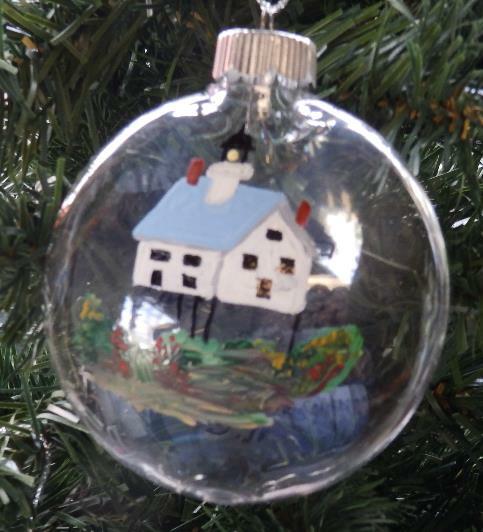 Hand Painted: $13.00 apiece or $35.00 for the set. $13.00 apiece or $35.00 for the set.